Skiing is a fantastic family holiday and Independent Ski Links offer a superb range and choice of family friendly catered chalets, chalet hotels and hotels and can advise on the most suitable options. See our tips for a successful and fantastic family holiday below - and click on the link to right to see a selection of family friendly chalets and chalet hotels who offer childcare and specialise in family holidays. Those days have gone now where you have to walk miles with your children crying behind you as their ski boots don’t fit and the chalet is down a steep and icy track. Let us guide you through our top favourite family ski resorts where there are plenty of good accommodation options to choose from. There are plenty of kids clubs, family ski deals and amazing ski schools available now where your children will be well looked after and have fun at the same time.Let us do the work for you and find your perfect family holiday. Some chalet operators offer a great choice of childcare options such as private nannies, chalet creche's and baby sitting services. 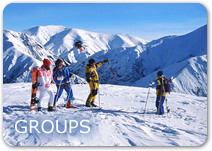 Through our links in the resorts and the knowledge we have built up over the years we can also provide you with details of local resort creche's and nanny services as well as recommending on some the best ski schools for children. Book early, as the most suitable family accommodation and most suitable travel options get booked up early - as do children's ski schools. The best priced family holidays with reduced child or even free child places also get booked up quickly. The earlier you book the more childcare options you will have. Try and choose accommodation with good piste/lift access - so children have the least distance to walk - or choose accommodation who provide transport to and from the pistes/lifts or ski school meeting point. Use our knowledge and links to source the best holiday and accommodation and best resort for an enjoyable family holiday. The traditional ski resort of Les Gets is part of the massive Portes du Soleil so advanced skiers and boarders will have plenty of miles to play in. The village itself is just over an hour transfer from Geneva which is great when travelling with children. Children love the mini train that runs between the main lifts and the Mont Chery area. The resort is a mixture of old traditional chalets mixed in with new chalets in the Savoyarde style. There is an ice rink, plenty of shops, bars and restaurants and a weekly market. There are lots of family chalet options with childcare for you to book in Les Gets. Courchevel is made up of Courchevel 1850, 1650, 1550 and Le Praz. There are good family chalet hotels and chalets in Courchevel 1850 and 1650. Courchevel really is the ultimate ski resort and as it is linked into the 3 Valleys there is plenty of skiing and boarding for all levels. The transfer is 3 hours from Geneva or 2 hours from Chambery. The resorts offer a real French charm and Alpine ambience in their shops, bars and restaurants. There are plenty of beginner’s slopes in Courchevel for children to gain their confidence on. The likes of the Chalet Hotel Crystal 2000 or the Chalet Hotel Dahu in Courchevel 1850 are a good choice for families as they are ski in/ski out and have excellent childcare options. Meribel is the neighbouring resort to Courchevel and is located in the centre of the magnificent 3 Valleys ski area. This is a fabulous village that always has plenty on offer for children of all ages throughout the week. There is a really lovely alpine atmosphere to Meribel. The resort spreads out up the side of the mountain so make sure you know where your chalet or hotel is located in relation to ski school etc. The likes of the Chalet Hotel Alba is ski in/ski out and comes with a dedicated nursery and snow club. If you prefer a chalet as opposed to a hotel there are plenty of options with childcare or with private nannies. This is the highest of the resorts in the Les Arcs area and therefore guarantees snow which is so important when skiing with children. As with our other favourite resorts it is part of a massive ski area so there is something for all ski abilities. There are 24 nursery slopes for children to progress quickly on. The doorstep skiing of Arc 2000 means that families can put their skis and boots on at the chalet door and get going from there which is a real treat. There are a selection of chalets that sleep 8 to 12 that you can either take over with family and friends or share with new friends. Val D’Isere is a popular choice and a favourite of many where families return year after year. Val D’Isere and Tignes make up the Espace Killy ski area which is a massive area with a huge amount of skiing for beginners, intermediates and advanced skiers too. There are plenty of good childcare options where you can book up the ski school and children’s clubs together. Book and stay right in the centre of the resort in the likes of the Chalet Hotel Ducs de Savoie or the Chalet Hotel Val D’Isere for top notch childcare that goes hand in hand with excellent dining and location.